Properties in Three Rivers average 4.6 out of 5 stars. 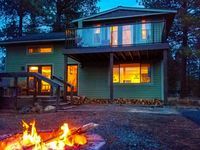 Gorgeous dog-friendly log cabin by the Deschutes River w/ private hot tub! Property 1: Gorgeous dog-friendly log cabin by the Deschutes River w/ private hot tub! Pet Friendly, luxury log cabin with hot tub near Sunriver! Property 2: Pet Friendly, luxury log cabin with hot tub near Sunriver! Welcome to the “The Bear Hut”! Property 3: Welcome to the “The Bear Hut”! Pet-Friendly Bend Area Cabin w/Hot Tub & Fire Pit! Property 5: Pet-Friendly Bend Area Cabin w/Hot Tub & Fire Pit! Private Log Cabin in Bend w/ Deschutes River View! Property 10: Private Log Cabin in Bend w/ Deschutes River View! 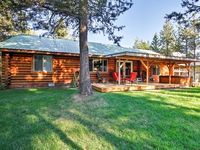 Pet Friendly Log Cabin near Sunriver w/Hot Tub, Fire Pit, Kayaks, Bikes & Game Room! Property 11: Pet Friendly Log Cabin near Sunriver w/Hot Tub, Fire Pit, Kayaks, Bikes & Game Room! Reconnect to the Earth and Nature by experiencing the Tipi to the Sun. Property 13: Reconnect to the Earth and Nature by experiencing the Tipi to the Sun. OWNER managed - Quiet, relaxing cottage near Sunriver Resort. Property 17: OWNER managed - Quiet, relaxing cottage near Sunriver Resort. Updated Sunriver Area Home on 1.5 Acres Near Bend! Property 18: Updated Sunriver Area Home on 1.5 Acres Near Bend! Now Accepting Reservations for 2019! Property 19: Now Accepting Reservations for 2019! Cozy, family-friendly home with shared pool - close to town. Free SHARC access! Property 24: Cozy, family-friendly home with shared pool - close to town. Free SHARC access! BOOK YOUR SKI WEEKEND NOW!! GREAT CABIN, GREAT RATES!! Property 28: BOOK YOUR SKI WEEKEND NOW!! GREAT CABIN, GREAT RATES!! Wood-beamed cabin with shared amenities (pools & hot tub) + SHARC passes! Property 29: Wood-beamed cabin with shared amenities (pools & hot tub) + SHARC passes! Riverfront Cabin backs to Nat'l Forest, near Sunriver w/Hot Tub, Fire Pit, Kayaks and Pet Friendly. Property 30: Riverfront Cabin backs to Nat'l Forest, near Sunriver w/Hot Tub, Fire Pit, Kayaks and Pet Friendly. Gorgeous home w/ SHARC access - shared pools & hot tub - convenient location! Property 31: Gorgeous home w/ SHARC access - shared pools & hot tub - convenient location! Cozy ski cabin w/ private hot tub, SHARC passes & great location! Property 37: Cozy ski cabin w/ private hot tub, SHARC passes & great location! Dog-friendly cabin close to the Village - SHARC passes included! Property 44: Dog-friendly cabin close to the Village - SHARC passes included! Cozy cabin w/ private hot tub, entertainment & SHARC passes - dogs ok! Property 45: Cozy cabin w/ private hot tub, entertainment & SHARC passes - dogs ok! Cottage on a private pond with Hot Tub perfect couples get away. Property 49: Cottage on a private pond with Hot Tub perfect couples get away. We spent a week during winter and everything was fabulous. The house is aesthetically very nice, well maintained, super clean and very comfortable. Everything was in working condition. The yard, hot tub, fire pit, deck, BBQ were wonderful to have and enjoy. The kitchen has great appliances and modern very nice utensils/pans etc. There was plenty of firewood to keep the house as warm as we needed it to be. There is so much to do in the area and right out the front door. We are dreaming of returning in the summer! !